Many varieties of mushroom are pretty well known for their medicinal benefits and people in Asian countries have been using them for their healing abilities for many centuries. Agaricus blazei or Murrill mushrooms which were first found in Brazil growing wild were taken to Japan where they have been extensively studied. Researchers have discovered that these edible, medicinal mushrooms have a significant effect on the immune system as well as an inhibitory effect on tumors and inflammation. If you are unfamiliar with these wonderful mushrooms and their remarkable healing potential, then read on…you may be very surprised at what you learn. What are Agaricus Blazei Mushrooms? The Agaricus blazei mushroom is an orange-brown colored fungus belonging to the Agaricaceae family. It is actually related to the portobella mushroom, which is the most popular mushroom in the world but is largely devoid of any medicinal ability. Agaricus blazei is also classed as Agaricus brasiliensis or ‘Brazilian blazei to avoid confusion with other mushrooms in the Agaricus species. When people refer to Agaricus blazei, they are often grouping three similar strains together – Agauricus brasiliensis, Agaricus subrufescens and Agaricus rufotegulis. In fact the reason that the mushroom is often called Agaricus blazei murrill is because the Agaricus subrufescens strain was originally identified in North America by the mycologist William Murrill. This adds to the confusion however since Agaricus brasiliensis is a native of Brazil which was initially identified by a Japanese researcher in São Paulo. 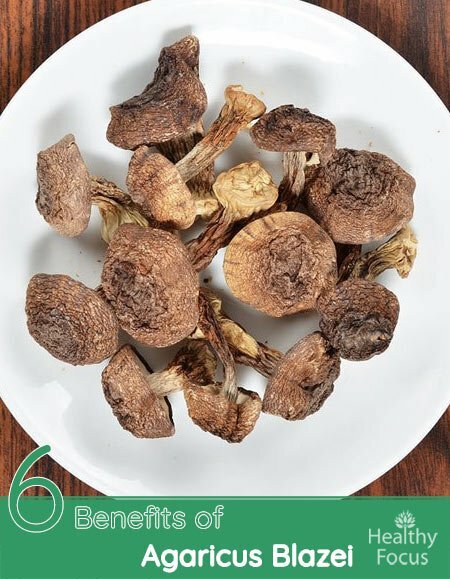 So in this article when we refer to Agaricus blazei, we are actually referring to this relatively new Brazilian genus which contains far more powerful medicinal properties than other similar strains. When eaten fresh, these mushrooms have a fragrance reminiscent of almonds and a slightly sweet flavor. They thrive best in warmer climes in partly sunlit locations especially areas near forest canopies. They are also known as Almond mushrooms, mushrooms of the sun and mushrooms of life and God depending on where you are in the world. Despite being the largest producers of Agaricus blazei, these mushrooms are not especially popular in Brazil. The bulk of commercial produce is destined for export. The mushrooms are especially popular in Japan as a dietary supplement. One of the best-known and well researched medicinal benefits of Agaricus blazei is their ability to boost the body’s immune system. These mushrooms and their extracts have been used traditionally to combat a wide range of diseases including diabetes, circulatory issues, high cholesterol, hepatitis, cancer and osteoporosis. Numerous studies over the past few decades indicate that they can significantly improve overall health and quality of life. Studies have found that one of the most important reasons for the health benefits of Agaricus blazei is that they contain various beneficial polysaccharides in the form of highly structured beta-glucans. These compounds are also known for their amazing ability to modulate the body’s immune response and provide protection against disease. Moreover, a Korean study published in 2004 found that Agaricus blazei could do wonders for those undergoing chemotherapy treatment. The researchers discovered that treatment with Agaricus blazei had a significantly positive effect on the common side effects of chemotherapy. The beta-glucan polysaccharides serve a natural purpose in defending the Agaricus blazei from invasive organisms. By the same token, they can be used medicinally by humans in order to fight against both viral and bacterial infections. Here is some good news for people looking to lose a few unwanted pounds. Agaricus blazei mushrooms may be able to help you achieve your goals. A French study published in 2013 sought to examine the effect of a mushroom extract on overweight and obese rats fed on a high fat diet. The researchers discovered that when the rats were given the extract, it effectively protected the rats from weight gain. READ What is the Best Rhodiola Rosea Supplement in 2018? Agaricus blazei mushrooms may be available fresh or dried but can also be bought in supplementary extract form. Because fresh mushrooms are difficult to come by for most of us, they are most commonly taken medicinally as a supplement. It is available as a bulk powder or in capsule form. Powder can be added to soups, stews or shakes. Medicinal mushrooms like Agaricus blazei are more effective when they are simmered or steamed in water. The process helps release the therapeutic compounds especially the beta-glucans and polysaccharides.